Add powder pack, soup pack, and noodles together with 400 cc boiling water. Boil for about 4 minutes. Reduce the amount of water for 2 or more noodles (2 noodles = 700 cc, 3 noodles = 1000 cc). Add some rice cakes and vegetables to the Rabokki for better taste. Manufactured in a facility that also processes milk, eggs, fish, crustacean, shellfish, tree nuts, peanuts, shrimp and sulphite products. Ingredients: Noodles: Wheat Flour, Palm Oil, Potato Starch, Refined Salt, Emulsified Oil (Soybean Oil, Emulsifier (E475)), Onion Extract, Stabiliser (E412), Colour (E101(i)). Soup Paste: Sugar, Water, Red Pepper Paste, Salt, Soybean Sauce (Soybean, Salt, Wheat), Red Pepper Powder, Apple Puree, Vinegar, Garlic Paste, Soybean Oil, Paprika, Welsh Onion Flake. 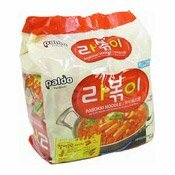 Simply enter your details below and we will send you an e-mail when “Rabokki Instant Noodles Multipack (韓國年糕拉麵)” is back in stock!